Toss first 6 ingredients in a large bowl. Soak 1 rice paper wrapper in warm water until soft (1 to 2 minutes). Shake off excess water. Place vegetable filling off-center on rice paper, and fold like an egg roll (tuck in the sides to keep the filling inside). Repeat with remaining vegetable filling and rice paper wrappers. 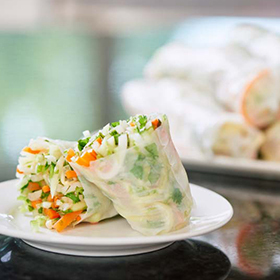 Once you have assembled all of the spring rolls, serve immediately. Serving size: 1 roll. Amount per serving: 70 calories, 1g total fat (0g saturated fat), 16g carbohydrates, 3g protein, 2g total fiber, 28mg sodium.